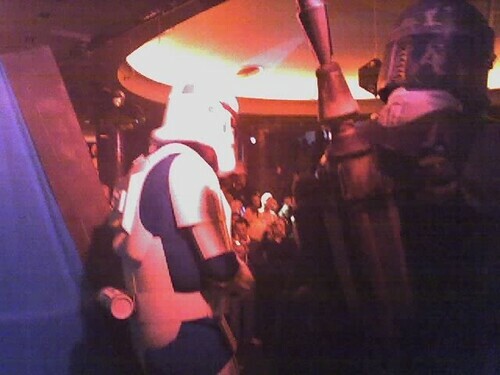 Last night the Ask.com party named Code Red was full of interesting people and a few stormtroopers here and there. Lots of LOUD music and celebration of Ask.com and the retirement of the butler as well. I didn’t get a shot of it, but they had the Ask butler displayed as if frozen in a big hunk of metal, ala Han Solo in Star Wars. There’s a photo of that on [email protected] blog. I’d like to say thank you to the people who have somehow recognized me and came up to say hi. It’s great to meet people in person and to get feedback. Jim has some good thoughts about the fun of networking at SES events. DoubleClick has announced the launch of their new keyword management, bid management and reporting tools, called DART Search that integrate with the DART Ad Management Platform. Adding DART Search enables clients the ability to manage their paid search campaigns as well as tracking their display, rich media and search advertising from one location. There’s quite a few bid management tools out there and I think DART Search is focused mosted on existing DART Ad Management clients. Although, adding the keyword and bid management tools may allow DoubleClick to win over clients that are currently outsourcing those services elsewhere. At Search Engine Strategies NYC on the Agency & Branding Track, the sessions “Putting Search Into The Ad Mix” on Wednesday and “Getting On Top In Paid Search” (covered by Chris Boggs over at Search Engine Roundtable) on Thursday that will be worth checking out. I will also be covering the “Ad Agencies and Search” session. One of the sessions that I covered over at Search Engine Roundtable was Rich Media and Video Ads where speaker Ian Schafer of Deep Focus previewed the Sopranos Google Maps mashup where you can view show episodes and other details by their location. Pretty slick. I think you’ll find more and more of this kind of creative being used in more advanced SEO programs that integrate with other online marketing tactics. A lot of what’s called viral is also linkbait and we all know what links can do for search engine rankings. Barry Diller is giving the keynote this morning at SES and it will be available live from my favorite internet radio station, WebmasterRadio.FM. The keynote is at 9am EST so be sure to visit WebmasterRadio.FM and click the “tune in” button. A podcast of the SES keynote with Barry Diller will be available shortly after. I ran into Daron Babin last night and there are few, more enthusiastic (or experienced) search marketers/entreprenuers in our industry quite like him. He and Brandy Shapiro have done some amazing things with WebmasterRadio.FM the past 2 years, and there’s more in store.¬† Hopefully, I’ll have details on that in a future post. The other interesting feature lets you see search engine rankings (Google, Yahoo! and MSN) for keyword phrases by the traffic they attract to the site. You can then compare rankings to the number of visitors, time on site, cost, revenue and ROI. I just got into my hotel room at the Hilton in Manhattan (nice room too) and I must say it’s been an interesting few hours. First, I got up at 4:30am to catch a 7am flight. Of course I decided to buy a new laptop last night and was up until 1am updating/installing, yada yada. This new Vaio with dual Centrino processors is very cool I must say. So after not being able to get MS Office working, I opt for Thunderbird instead of Outlook. Thunderbird imported my pst file without a hitch. Firefox bookmarks and sage feeds transferred just fine. Thomas (TwisterMC) has updated a few of our public tools for blog marketing. First, the RSS Feed Button Maker has been updated with additional support for Textpattern, MovableType and Blogger. Also, we’ve launched a new Social Bookmark Links Tool. This is a fantastic new tool that allows you to easily create links embedded with your blog post urls for over 30 social bookmark and tagging sites. Why would you do that? Social bookmark sites like del.ico.us, digg, furl and others offer the opportunity for visitors to bookmark blog posts to a shared bookmark web site. Each bookmark by users is a vote for a page. Those “votes” can drive traffic to your blog post and can also help rankings since each bookmark is a link. Dave Naylor and Mikkel De Mib Svendsen (gotta love the red suit) have launched a new SEO Podcast blog called Strikepoint in conjunction with WebmasterRadio.fm. I’ve listened to a few shows already and it’s very good (and funny). The show on BMW Germany’s issues and Google is particularly interesting. Here’s an entry about Outrageous And Contagious – Viral Videos. This is an interesting and timely post as I do believe viral/creative SEO is the future of organic search marketing. That and online PR. If you haven’t checked out WebmasterRadio.fm’s awesome shows, you are missing out on some excellent information. Top voices in search marketing from Danny Sullivan to Tim Mayer of Yahoo talk about current issues, tactics and trends. Fire up your iPod because these shows are a must-listen. Over at the SEM 2.0 discussion group run by Andrew Goodman, there’s a thread about buying domain names that has been offering some excellent suggestions. One post from Dan Perry, offers a good fundamental list of recommendations. And yes, I asked Dan for permission to post. Dan says he likes to use Snap Names for domain name purchases. First, find the PR of the domain. This can be found at any PR checker. It lets you put in 20 at a time. The value of PR is in the fact that there is some. $? ?, 1-2 million = $? ?, and so on. Loren Baker of Search Engine Journal and John Scott of v7n recently took a tour of the Google offices in Japan. You can view photos here. They were able to visit with Google reps and discuss everything from local search to censorship. A little on Matt Cutts too. Sounds like a great visit. Loren will be covering the upcoming Search Engine Strategies conference that is coming to Tokyo, Japan April 20-21. Let’s start the rant engine folks…. CNET reports that uber blogger, Jason Kottke has pulled the plug on blogging for a living. All I can wonder is, why it took this long? What kind of business model is micropayments? The guy needs to stop drinking his own Kool Aid and treat that blog like a business, not an experiment. It’s a bit disheartening, really. So much potential and opportunity not realized. Kottke.org is one of the most popular, most visited blogs on the planet – #23 on Technorati’s list of popular blogs. Throw some damn AdSense on there Jason! There are over 13,000 pages on that domain and over 450,000 inbound links. I hear some SEOs out there salivating. What could you do with a site like that?